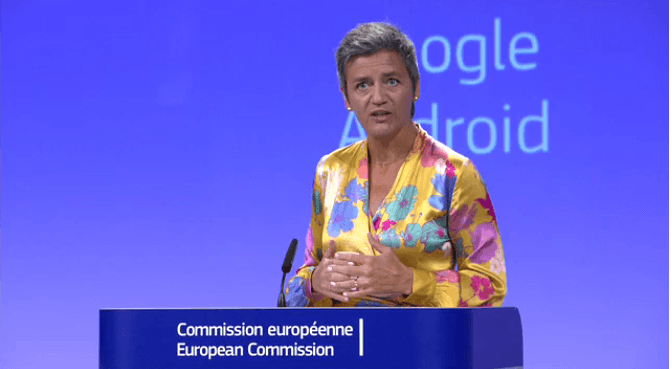 European Commissioner for Competition, Margrethe Vestager, just announced the EU‘s third big antitrust fine against Google. The EU found the company guilty of breaking antitrust laws when it prevented third parties (i.e. Google‘s ad-brokering competitors) from using its advertising tool, AdSense, to display search ads. This has now resulted in a €1.49 billion fine (1.29 percent of Google‘s turnover in 2018). The AdSense fine is the latest chapter in the EU‘s long struggle long struggle to tame the tech giant. Previously, the EU has slapped the American firm with a €2.4 billion fine for demoting competing shopping services in searches, and a record-breaking €4.34 billion fine for illegal restrictions on the use of Android. Like AdSense, these investigations found that Google had abused its dominant market position to stifle competition. Google has denied all charges in the past, and will likely fight the AdSense decision like it did with earlier fines. The AdSense case was last of the three big antitrust investigations on Google‘s activities in Europe, but that doesn’t mean it’ll be smooth sailing from now on. Vestager said during the press conference that Google has made adjustments after the other antitrust cases to ensure fairer operations, but didn’t want to rule out the possibility of taking the company to task over future violations. Antitrust enforcers have reportedly been asking Google‘s rivals if the company unfairly demotes local search competitors, possibly hinting at a fourth antitrust case. Then there’s also the fact that Vestager, the driving force behind the probes into big tech, is likely to seek to stay on as Competition Commissioner for another five-year term. Vestager has led the charge against tech behemoths, and is easily one of the more recognizable politicians in the tech sphere. She’s been extremely vocal about the need for tech to serve people, and how illegal competition by the likes of Google smothers technological innovation. Her plans to stay on as Competition Commissioner might, however, be hindered by the current Danish Prime Minister, but Vestager is also a popular choice for who should follow Jean-Claude Juncker as President of the European Commission. So it seems Google will need find a way to appease Vestager in the coming years.